So you say you’re a lonely little vlogger with no one to hold your video camera while you go on and on about…whatever it is vloggers talk about? Well, not to fear – this neat little tool holds your iPhone and, as long as you’re wearing the accompanying beacon, swivels it around to follow you wherever you go. 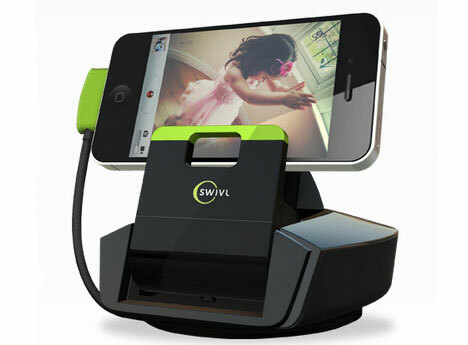 The Swivl stand is a concept that will soon be available for anyone who wants to film themselves but doesn’t want to ask a friend for help. It easily holds an iPhone, iPod Touch, Android phone or Flip camera. There’s no setup required and it can even be used with a tripod. It’s available now for pre-order, but at $160 you’d better be pretty dedicated to your vlog to snag one. See more in Camera & Video or under Gadgets. November, 2011.